Which lesbian is the 'man' in the relationship? Which lesbian is the ‘man’ in the relationship? Home » Can I really ask her that? » Which lesbian is the ‘man’ in the relationship? This blog post comes from a conversation I was having with a fellow lesbian. I was interviewing her for my 30 days – 30 voices – stories from America’s LGBT business leaders podcast project. I was telling her about my first book called “But You Don’t Look Gay…”, and explaining how I came up with the title of the book. Which is because it is one of the many expressions I hear often enough to merit a discussion and educational lesson around. Within three seconds she rattled off a handful of others, the best out of the bunch being, “So… which one of you is the man?” Such a delightfully uncomfortable question many lesbians have been asked. Whenever I write a blog I do some research around the subject and will often start by Googling the topic. When I Googled this phrase this great quote came up from comedian, Mae Martin. Asking a lesbian couple ‘which one of you is the man in the relationship’ is like asking a vegetarian ‘which one of those vegetables is the pork chop in this salad? The definition of being a lesbian is a women being attracted to or in a relationship with another woman. Why must there be a need for someone to be the ‘man’ in the relationship? If the question is being asked because of the societal need for one woman in a relationship to be the ‘manly one’ and one needing to be the ‘feminine one’ then that is playing into poor stereotypes. You don’t want to find yourself perpetuating poor stereotypes in any setting, especially business. I feel there isn’t much more to say about this phrase than what Mae stated. It seems like the most random question ever when you apply it to vegetarians, doesn’t it? As always, if you are guilty of having asked this in the past. It is okay. Now you understand that no one appreciates being asked this question and you can avoid asking this in future conversations. 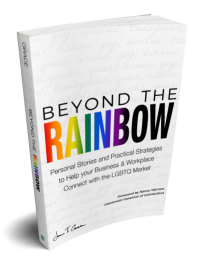 If you are you looking for more information on how to communicate with the LGBT community, take a moment to check out my first book, “But You Don’t Look Gay…”click here for more information! 3 Responses to Which lesbian is the ‘man’ in the relationship? Thank you for taking the time to provide your well articulated thoughts. Appreciate it! THANK YOU! Finally an article that talks about how stupid this question. You wouldn’t believe the amount of times I get asked “Who is the man in your relationship” or people acting surprised because me and my girlfriend are both “feminine.” It’s crazy and just highlights people’s underlying prejudice and assumptions I think. Just like straight couples, every gay couple is different and people are attracted to different types of people.